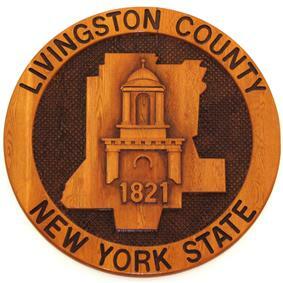 Livingston County is a county located in the U.S. state of New York. As of the 2010 census, the population was 65,393. Its county seat is Geneseo. 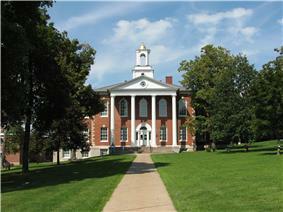 The county is named after Robert R. Livingston, a member of the committee that drafted the Declaration of Independence. Livingston County is part of the Rochester, NY Metropolitan Statistical Area. Livingston County is located in the Finger Lakes region, south of Rochester and east of Buffalo. Letchworth State Park in partly in the western part of the county. The Genesee River flows northward through the county. The Rochester and Southern Railroad (RSR) traverses the county from Greigsville south thru Mount Morris to Dansville. According to the U.S. Census Bureau, the county has a total area of 640 square miles (1,700 km2), of which 632 square miles (1,640 km2) is land and 8 square miles (21 km2) (1.30%) is water. Livingston County is governed by a 17–member legislature headed by a chairman. As of the census of 2000, there were 64,328 people, 22,150 households, and 15,349 families residing in the county. The population density was 102 people per square mile (39/km²). There were 24,023 housing units at an average density of 38 per square mile (15/km²). The racial makeup of the county was 94.04% White, 3.01% African American, 0.27% Native American, 0.76% Asian, 0.03% Pacific Islander, 0.85% from other races, and 1.04% from two or more races. Hispanic or Latino of any race were 2.27% of the population. 22.5% were of German, 17.7% Irish, 14.3% Italian, 12.8% English and 7.0% American ancestry according to Census 2000. 95.8% spoke English and 2.0% Spanish as their first language. Cassius McDonald Barnes, American Civil War soldier, served as the 4th Governor of Oklahoma Territory; born in Livingston. ^ W, Eric (2012-03-02). "Senate District 57". View 2012 Senate District Maps. ^ W, Eric (2012-03-02). "Senate District 59". View 2012 Senate District Maps. ^ W, Eric (2012-01-25). "Assembly District 133". View Proposed 2012 Assembly District Maps. ^ "Cassius McDonald Barnes". Find A Grave. Retrieved September 19, 2012.